The first tug to be fitted with Caterpillar's Advanced Variable Drive, a hybrid system, is one of Sanmar’s popular and successful Bogaçay Series. It will be the 38th of this class to enter service, a class designed exclusively by RAL for Sanmar. Photo courtesy Sanmar. 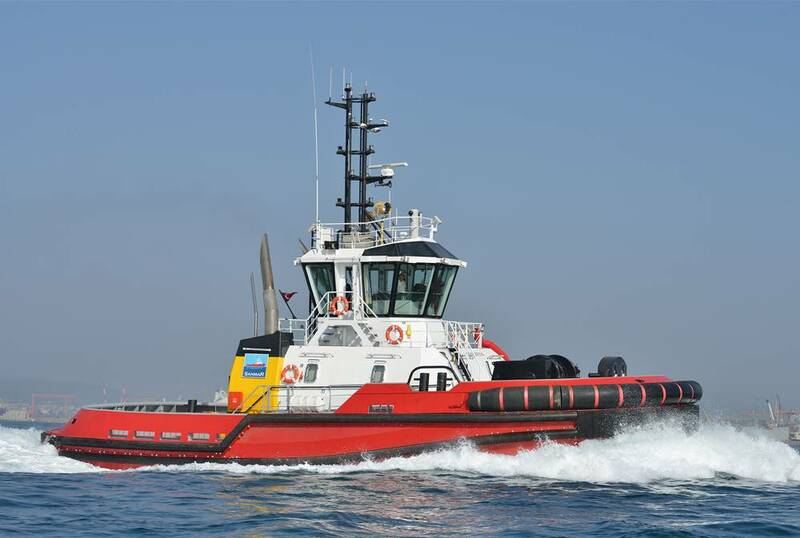 Turkey’s leading tug builder Sanmar Shipyards was selected by Caterpillar Marine to build the first tug to incorporate its hydraulic hybrid propulsion system. Construction is currently under way with delivery scheduled for October 2019. Furthermore the two companies, from different continents, are joining together to present their collaborative efforts at the Tugnology 19 Conference and Exhibition, scheduled to be held in Liverpool, England, May 14-15, 2019. Tugs represent some of the more power dense and cost competitive vessels, making them uniquely challenging platforms in which to adopt hybridisation technologies. The engine room space and acceptable centre of gravity envelope is fairly limited, generally precluding adaptations of full diesel-electric propulsion and integrating large capacity battery packs. The Cat Marine Advanced Variable Drive (AVD) is a patented system leveraging Caterpillar’s experience with integrated power systems technology. Sanmar the largest tug builder in Turkey with more than 40 years of experience in the international tug building industry, is looking to again break new ground following on from being the world’s first builder of LNG powered tugs as well as the builder of the world’s first commercial remotely operated vessel. Since the beginning of the new millennium, Sanmar has built 200 tugs at its two custom built tug building yards to designs by its chief design partner, Robert Allan Limited (RAL) of Vancouver, Canada. The model chosen is Sanmar’s popular and successful Boğaçay Series and it will be the 38th of this class to enter service, a class designed exclusively by RAL for Sanmar. However, this will be the first hybrid version. Optimized for harbor tug operations, this compact tug design provides 70 tonnes of bollard pull and full fire-fighting (Fi-Fi 1) capability. The AVD system is designed to provide significant improvements in both fuel efficiency and vessel performance through a fully integrated hydro-mechanical propulsion system. Different from a typical Power Take-In (PTI) solution, the AVD incorporates a planetary gear set allowing seamless clutch engagement of main engines, auxiliary engines, or both to provide a scalable power installation to meet any customer need in terms of maximum vessel speed, power, or bollard pull. This allows propeller speed independent of engine speed so optimal engine efficiency can be achieved, leading to fuel savings of 15% to 20%. Basically, all the benefits of a variable speed DEP system at a fraction of the cost and size. The AVD system is also flexible and can accommodate multiple configurations. Auxiliary engines can be utilized to accommodate low load or transit operations greatly extending time to overhaul and reducing service costs on main engines. AVD enables straight forward integration of either diesel, natural gas or gas turbine engines or any combination of these as prime movers, accommodating various levels of engine load acceptance capability and engine speed regimes. As a direct result, main engines can be downsized in most applications, with supplemental power provided by auxiliary engines. The system provides inherently high levels of propulsion redundancy. It is fully scalable to meet requirements of a wide range of vessel types, applications, and power levels. Compared to traditional tugs, the hydraulic hybrid propulsion system on Boğaçay 38 will dramatically reduce fuel consumption and carbon emissions as well as through life maintenance costs. Given the propensity for tugboats to work in waters near populated coastlines and in big city ports, the ability of this technology to mitigate climate change in a meaningful and measurable way is both promising and exciting.